South Africa is a place close to my heart. While I haven’t traveled there (yet) my father and older brother have spent time there getting to know the culture and the people. They always come back with stunning photos of the landscape and smiling images of the country’s children, like the one above. 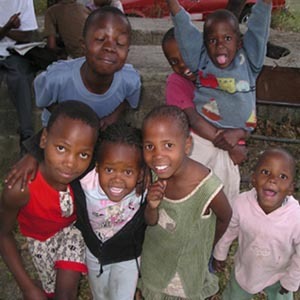 When I look at those little faces I am stricken with the thought that nearly 20% of all children in South Africa are orphans, with approximately 1.9 Million of those children orphaned as a result of HIV and AIDS. On top of that, 65% of ALL South African children live in poverty. Lunches at school are a huge part of these kids’ development and an incentive to continue their education. Think about the lunches you ate as a kid: peanut butter and jelly, soup in a thermos, carrot sticks, apple slices, juice boxes, granola bars. I never wondered if there was going to be a salami sandwich (my favorite) in my Strawberry Shortcake lunchbox. But some kids do wonder–every single day. Children who don’t have enough to eat don’t have the capacity to work towards a proper education. That’s where the Lunchbox Fund comes in: The Lunchbox Fund has been feeding impoverished and orphaned schoolchildren since 2005. It brings communities together with the help of small local businesses and entrepreneurs, and provides vulnerable students with healthy meals that nourish their bodies and minds (source). So today, as I’m eating my chicken salad sandwich and roasted beet salad, I’m heading on over to The Giving Table to donate to The Lunchbox Fund. I’m bringing my lunch to work this week in order to donate as much as I can. Here’s a fun fact about my lunch habits: If I bring leftovers to work or make my lunch at home JUST ONE DAY this week, I will have $10 to donate. And just $10 can feed a child their only meal of the day. If The Lunchbox Fund meets their campaign goal of $5,000, 100 school children will eat lunch for an entire year. That sounds like something I want to be a part of! So who’s with me? Will you donate just one lunch this week to a sweet-faced child in South Africa? If you’d like to know more about The Lunchbox Fund, watch this video or follow this link: Provide a daily meal to South African school children. The Lunchbox Fund from Khanyisa Films on Vimeo. Now I want to donate AND eat a salami sandwich. Ah, tell me about it! Pickles wrapped in salami used to be favorite after school snack. My sister rolls salami around cream cheese for parties, and it sounds too simple to be good, and maybe even gross, but holy crap. It’s delicious. Wait…I’ve seen that in some Midwestern cookbook. They call it cowboy sushi or something? A pickle rolled in cream cheese with salami acting as the Nori. Sounds like heaven to me. I’m in! And now I can’t stop thinking of the salami sandwiches of my childhood. It wasn’t a lunchbox treat, but, instead, was reserved for weekends when we were living on the boat (yep, living on the boat. one of the perks/travails of being a fisherman’s daughter). It was genoa salami on a portugese roll with lettuce, roasted red peppers, olive oil, and salt and pepper. Just the thought of it transports me right back to being a little kid strapped in a giant life jacket while I watched for seagulls and fish. Genoa salami!! Your sandwich sounds so delish – and eating it on a boat on the sea sounds like heaven. Did you enjoy that part of your childhood? Or would you rather have been land bound on those weekends? The boat was a mixed bag. On one hand, it was amazing to spend my childhood summers on the ocean and running around on the docks. It was often the stuff of dreams. But, on the other hand, it could be kind of lonely because I really didn’t see my friends from school very much and, at the end of the day, a fishing boat is a very small place for 2 adults and 3 kids (i.e. no room for toys), so a lot of the time was spent crowded around a tiny television watching movies appropriate for my youngest brother (who is 6 years younger than me). I will never get back the approximately 1,719 hours that I spent watching Pete’s Dragon. I never wondered where my lunch came from, but now working back with public schools, I’m reminded that such a fear exists. Just last week a school in Utah threw away dozens of children’s lunches because their accounts were delinquent. THREW THEM AWAY! This isn’t just an international problem, it’s global. Thanks, Rachel for reminding us once again of how fortunate we are and that there are always those so far less fortunate.